Shane Black’s The Predator is dumb, there is no doubt about that. It is loud, rambunctious, over-the-top in its violence, extremely profane, and is somewhat of a structural mess. It is, by most accounts, a stupid movie filled with such utter nonsense even for the Predator franchise… and yet, as silly as it all was, I couldn’t help but have a fair bit of fun with it all. I’m sorry, but I can’t help it; I know this movie is technically not very good, and I know it’s going to be the sort of film that divides fans as much as something like Prometheus did, but if you asked me for my opinion, this was a dumb action movie that I could actually switch my brain off and enjoy, despite knowing full well that what I was watching was not exactly high art. That alone puts it above other dumb blockbusters this year like The Meg, which I didn’t hate but didn’t enjoy as much as I had hoped, because with this I could at least enjoy myself up to a point while also recognising that what I was watching wasn’t smart filmmaking by any stretch of the imagination. So yeah, I’m not afraid to admit that The Predator was dumb but fun; I’ll probably get flak by some, but honestly I don’t care because I still found this to be a delightfully silly guilty pleasure. The Predators, if you’re not familiar with this series, are an extra-terrestrial species that basically travel to Earth and hunt humans for sport; here, their arrival on Earth has not gone unnoticed by a secretive government organisation known as Project Stargazer, overseen by agent Will Traeger (Sterling K. Brown) who has his own fascination’s with the Predator’s ship. Meanwhile, in a plot that admittedly has way too much going on with far too many characters to focus on, US Army sniper Quinn McKenna (Boyd Holbrook) encounters the creature but is dismissed by his superiors and placed on a bus filled with other crazed military types – among them Moonlight’s Trevante Rhodes, Thomas Jane, Alfie Allen, and even Keegan-Michael Key for good measure – who all soon help him track down and hunt the creature. They in turn are joined by disgruntled scientist Casey (Olivia Munn), and along the way Quinn’s autistic son Rory (Jacob Tremblay) factors into it as well – and if you think that wasn’t already quite a lot on this film’s plate, there’s also a bigger, much more CGI’ed Predator that’s after the regular one for reasons that are not made entirely clear. Like I said, this movie is kind of all over the place, with so much stuff going on in the plot with characters who aren’t very well-defined and who do things that more often than not don’t make a whole lot of sense, and it doesn’t take a genius to recognise that it’s all kind of an incoherent mess. But the thing is, Shane Black directed and co-wrote this movie (after appearing the Schwarzenegger original as the ill-fated Hawkins), and if you know anything about this guy and the kinds of movies he’s written or directed, you’ll know that he’s not just set out to make any kind of dumb movie, even though it can certainly come off that way at times; he’s a smart enough guy to realise that with this kind of crazy material, going over-the-top is the only way you can make it work at all, and luckily he brings a lot of his trademark sense of humour to this movie, as well as an underlying sense of fun and an awe-inspiring amount of blood and guts to really go all out with its total embrace of the stupidity. There are quips here that did make me chuckle, and also moments of unexpected violence that honestly made me really glad I was seeing this on an IMAX, not to mention the fact that his cast are totally on board with the direction that Black is taking and, like him, are clearly having a blast bringing all of this nonsense to life (one of the standouts for me was Munn, who I’ve always liked as an actress despite the lesser material she is often given to work with, and she is a lot of fun in this movie, but after the recent news concerning her role in this film and what was cut out of it by the studio I respect the hell of her more now than I ever have done). Nonetheless, as much enjoyment as I was honestly getting out of most things in this movie, from parts of the dialogue to the extraordinarily graphic displays of violence, I always knew that this was a pretty dumb movie. The story is filled with way too many characters and plots, it all goes along at such a break-neck speed that you’re barely left with much room to breathe, there is some pretty bad CGI in this (Preda-dogs, anyone? ), and overall it’s filled with such machismo cheese that anyone with a brain could automatically reject as trashy nonsense. However, most of these problems can also be attributed to Mile 22, and the major difference between that film and this one is that The Predator just happens to do all of those things to a far more tolerable degree than Peter Berg’s sense-killing dreck of a film; I liked the characters way more here, as ill-defined as most of them were, I thought it was funnier (it’s Shane Black, so how could it not be? ), it had a lot more ambition to its over-the-top violence, and it’s made by a director who actually wanted to make this film, in comparison to Peter Berg who probably signed on to make Mile 22 after losing a bet. 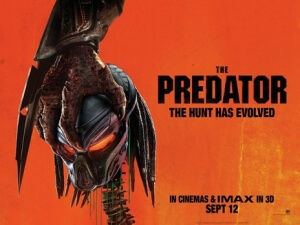 All you Predator fanatics can call me out all you want for not hating this movie, and I know some who are already dead set against it, but while I fully admit that this was not an especially good movie, I can at least say that I had enough dumb fun with it to make just the one viewing of it worthwhile. The Predator is deeply flawed, with an overstuffed story filled with ill-defined characters and logic that often makes very little sense, but once your brain is switched off you’ll find that it’s a gleefully over-the-top action movie that doesn’t take itself too seriously and actually has enough fun with itself to make itself reasonably enjoyable.